The strange case of the 1941 UT football season. 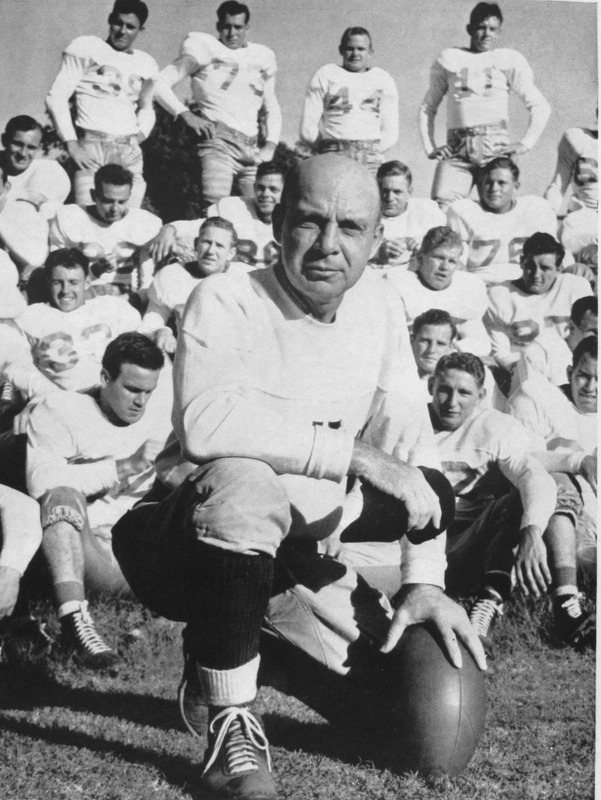 When he was hired in 1937, UT head football coach Dana X. Bible (photo at left) claimed the Texas Longhorns would be a “winner of a football team” in five years. As the 1941 season loomed, the coach’s predictions seemed likely to come true. Since its inaugural season in 1893, the University of Texas football program boasted a lengthy list of regional successes – including an undefeated squad in 1900 – but had yet to earn respect as a national power. By the 1930s the team was lackluster and inconsistent. The 1932 squad posted a respectable 8-2 record, but had slid to 2-6-1 by 1936. The first two years at Texas were rough. Bible’s 1938 team posted only a single win before the program began to improve. But as the 1941 season approached, hopes and expectations were high among the Longhorn faithful. The schedule opened with a 34-6 victory over the University of Colorado, and continued with decisive wins over LSU, Oklahoma, Arkansas, and Rice. When Texas blanked Southern Methodist University 34-0, the Longhorns were routinely outscoring their opponents by more than 30 points. For the first time in UT’s history, the Associated Press (AP) ranked the Longhorns as the best in the country. 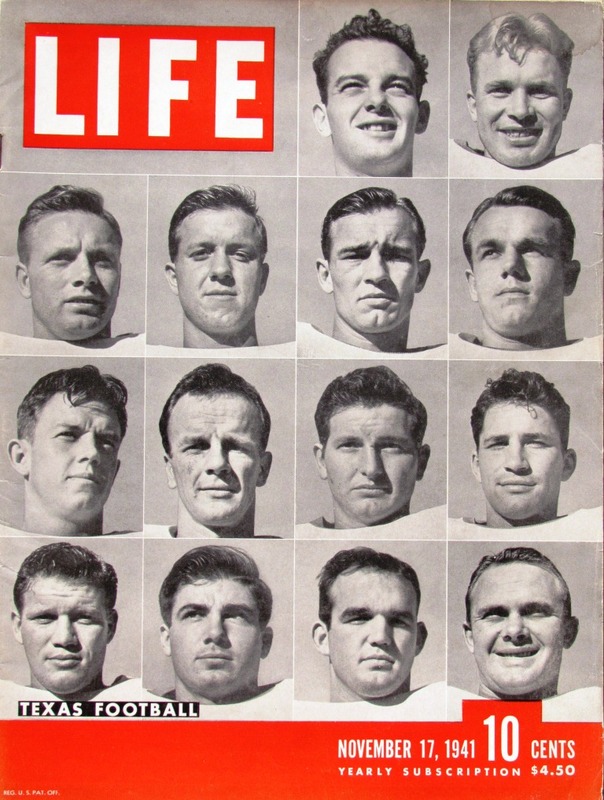 Life magazine elected to make the team its cover story for the November 17th issue (photo at right), which was to be released just in time for the upcoming Baylor game. The victory over SMU, though, exacted a price. Four key players were injured and would be unable to participate the next week. And Baylor, playing at home in Waco, was understandably motivated at the prospect of hosting the No. 1 team in the nation. The Bears fought hard to earn a 7-7 tie with Texas, and as there was no overtime, the score ended UT’s perfect record. That evening, a devastated Texas football squad arrived at the Austin train station at Third Street and Congress Avenue. They were met by thousands of supportive fans who escorted the team to campus with a torchlight parade (photo at left), though the mood was tainted and somber. 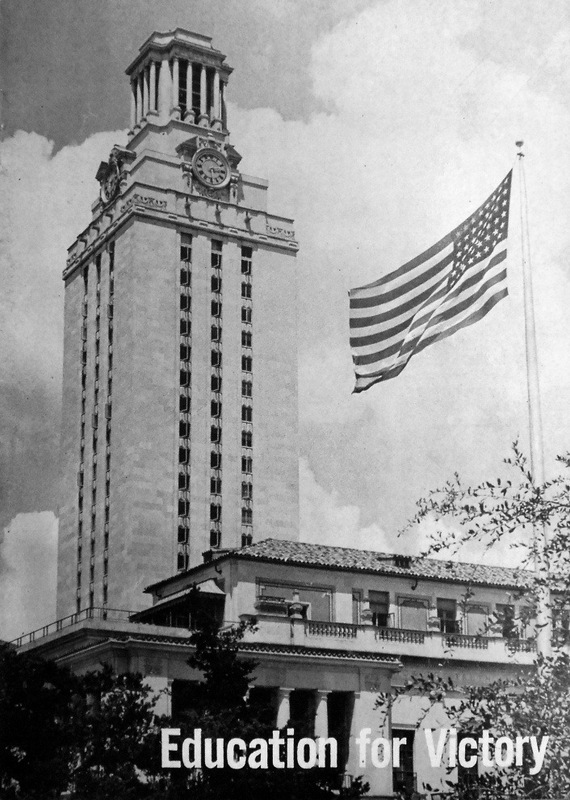 In recognition of the tie score, the Tower was floodlit half orange and half white, but when the next AP poll was released, Texas had fallen to No. 2, behind the University of Minnesota. Texas Christian University was next on the schedule, and while the Longhorns tried to shrug off their disappointment in Waco, the “curse” of the Life magazine cover lingered. For most of the game, the score was again tied 7-7, but with eight seconds left in the final period, TCU’s Emory Nix completed a 19-yard pass to Van Hall in the end zone to give the Horned Frogs a 14-7 victory. Hapless Texas saw its ranking drop eight positions to 10th. On Thanksgiving Day, UT was to travel to College Station to take on the Texas Aggies. Texas A&M was having a banner season. Undefeated and ranked second in the nation by the AP, the Aggies had already won the Southwest Conference Championship. They also had a jinx on the Longhorns. Since 1923 -for 18 years – the Longhorns had been unable to win a game at Kyle Field. Desperate to break the College Station spell, UT students consulted Madam Augusta Hipple, a local fortune teller. 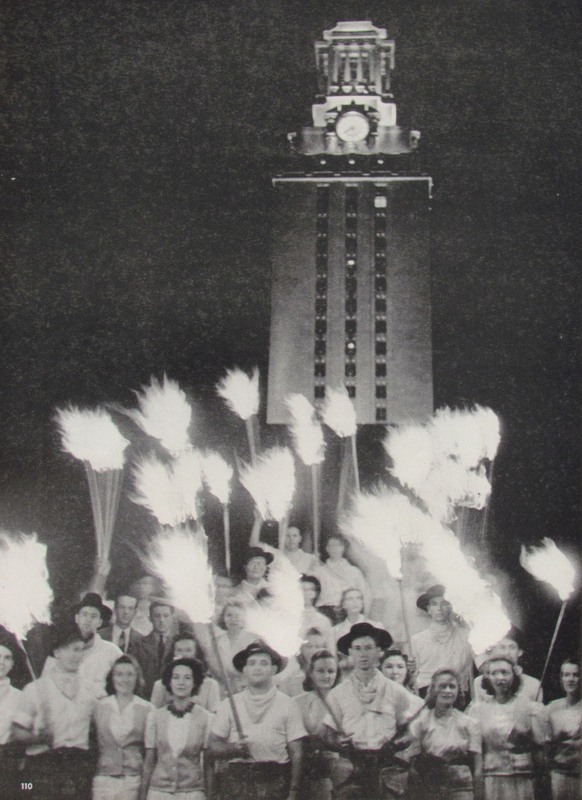 She instructed the students to burn red candles the week before the game as a way of “hexing” the Aggies. 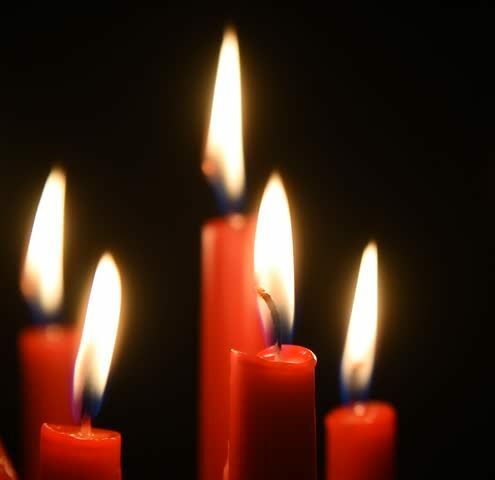 Through the week of Thanksgiving, Austin shops found it difficult to keep red candles in stock. Candles were burned in store windows along the Drag, in the fraternity and sorority houses of west campus, in the lounges of university residence halls, and in the windows of Austin’s neighborhoods. Madam Hipple knew what she was doing. By uniting the football team and its fans with such a visible show of support, how could the Longhorns fail? They didn’t. Texas went to College Station, defeated the Aggies 23-0, ended the 18-year jinx and restored their pride as the AP’s final poll listed Texas as No. 4. The season wasn’t quite over though. Texas was to host the University of Oregon on December 6th, but the major bowls were already extending invitations. Many of the sports media predicted the Longhorns would travel to Pasadena for the Rose Bowl to play Pacific Champion Oregon State, but bowl officials were nervous about UT’s upcoming game with the Oregon Ducks. Earlier in the season, Oregon State had eked out a 12-7 win over their cross-state rivals. Suppose Texas was invited to Rose Bowl, but then lost their final regular game to Oregon, a team Oregon State had already defeated? To play it safe, the Rose Bowl invited Duke (then ranked No. 2) instead. Furious at being snubbed, Coach Bible announced that Texas wouldn’t accept invitations to any bowl games, and was eager to show the Rose Bowl officials what they might have had in Pasadena. In front of 30,000 fans, Texas overwhelmed ill-fated Oregon 71-7. There was no mistaking in Bible’s message. As a final curtain call with just a few minutes left in the game, the coach sent in his first string players to a standing ovation. Three plays later, as the crowd sang “The Eyes of Texas,” the Longhorns scored their tenth touchdown of the day. Austin was still celebrating on the morning of December 7th. “Boy-o-boy!” exclaimed The Daily Texan, “Where is the Rose Bowl, and who cares?” After early church services, many students walked through downtown Austin in search of lunch. 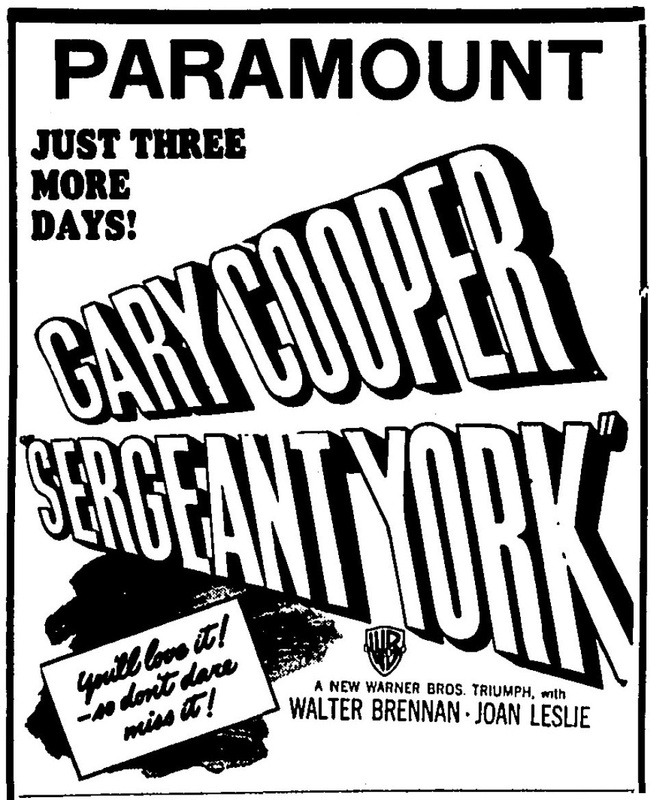 A few went to the Paramount Theater and paid the 40 cent admission to see the noontime showing of Sargent York, starring Gary Cooper. The top-grossing film of the year, it related the experiences of Alvin York, among the most-decorated American soldiers of the First World War. When the movie began, the audience knew that, despite what they saw on the screen, the world outside was still at peace. But as they left the theater, it was soon clear that everything had changed. News of the attack on Pearl Harbor reached Austin by 12:30 that afternoon, and shattered the joy of the football victory the day before. Most people huddled in groups around radios and listened for the latest reports. Evening events were cancelled, and Austinites with family stationed in Hawaii worried about the fate of their loved ones. “What do we do now?” was the question of the day. By Monday morning, military recruiting stations in town were busy, as were the offices of the Red Cross. Before the end of the week, UT President Homer Rainey had outlined a plan for the University to participate in the national war effort. Fearing an air raid along the west coast, the U.S. Government prohibited all large public events for the duration of the war, including the Rose Bowl. Instead, the game was moved to the visiting team’s stadium, in this case, to the Duke University campus in Durham, North Carolina. 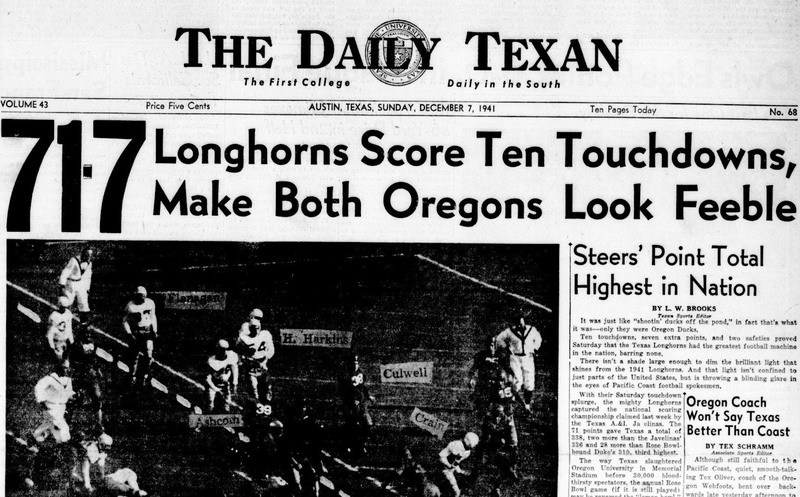 Oregon State managed a 20-16 upset over the second-ranked Blue Devils, but if the bowl officials had invited Texas as was expected, the 1942 Rose Bowl would have been held at Texas Memorial Stadium in Austin. Great article, Jim! Keep ’em coming! My goodness. What a story. You are the best storyteller we could ever have.